"...there is no ability under provincial legislation to assess the ...effects of multiple decisions on ...watersheds. Nov 2016. Muddy water from logging road in Goose Creek area entering culvert. It flows through the culvert, then flows through the forest and enters Goose Creek at the bottom. High turbidity in water. Goose Creek area. FPPR (Forest Planning and Practices Regulation) Section 8.2 sets out government's objective for water in community watersheds. 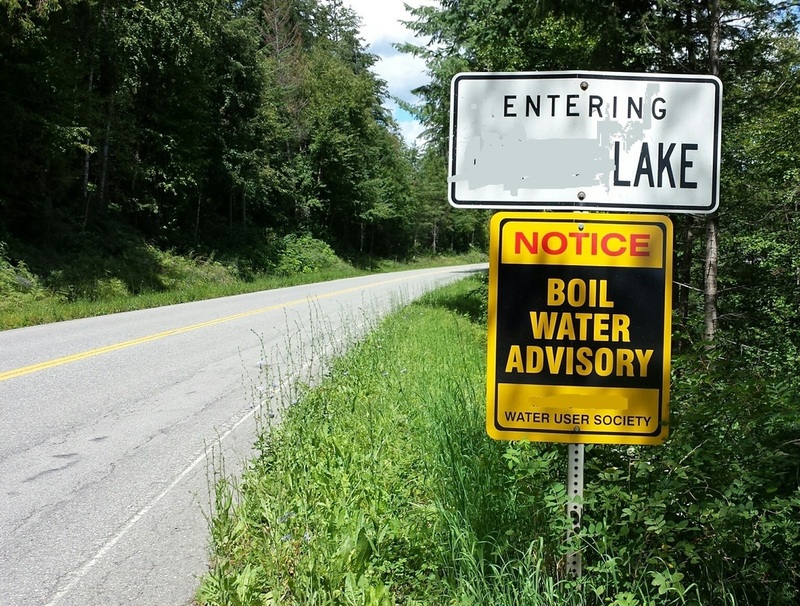 FPPR section 8.2 does not provide a remedy should water in a community watershed be damaged. In fact, there is no legal requirement for a forest licensee (the logging company) to achieve government's objective-only to include a consistent result or strategy in its Forest Stewardship Plan. However, the Drinking Water Protection Act and regulations require a water supplier to provide drinking water that meets specified standards. If new or additional treatment is required to address degraded water, the cost would fall to the water supplier (who might have to subsequently negotiate or litigate with the party that damaged the water). (2) The objective set by government for water being diverted for human consumption through a licensed waterworks in a community watershed is to prevent to the extent described in subsection (3) the cumulative hydrological effects of primary forest activities within the community watershed from resulting in (a) a material adverse impact on the quantity of water or the timing of the flow of the water to the waterworks, or (b) the water from the waterworks having a material adverse impact on human health that cannot be addressed by water treatment. (3) The objective set by government under subsection (2) applies only to the extent that it does not unduly reduce the supply of timber from British Columbia's forests. The legal framework for forestry in BC permits forest licensees to exercise discretion in their forestry practices as long as they achieve the required results. In order to do this—and to protect public interest on Crown land—licensees rely on qualified professionals to plan and oversee their practices and on strong government enforcement. However, the law also recognizes that timber development can create risks to other values, such as water, and that sound forestry practices can reduce but not eliminate this. Should a situation occur whereby a forest licensee causes an unintended impact on a resource value, the forest licensee may be deemed not to have contravened the law if it can demonstrate to the government that it exercised due diligence (i.e. demonstrates that due care was exercised to avoid contravening legislation). There is no legal requirement for logging companies to achieve the government's objective (IE, to protect community water). There is a legal requirement for the water supplier to guarantee safe and clean water for its users. If a water system is damaged by logging and/or road building, the cost is born by the water users, not those who damaged it. The water users might be able to sue for damages etc. The government's objective for a waterworks system is that it should not be damaged in terms of flow, quantity or safety. If the water is damaged in terms of the safety, and it can be treated through chemicals or expensive water treatments to become safe again, it is not considered to be damaged. However, the government only holds this tenuous position on water safety if it does not 'unduly reduce the supply of timber'. BC legal framework allows logging companies to use their discretion and to rely on professionals. The law also recognizes logging can damage water systems and that this damage can only be reduced, but not eliminated. If damage occurs while the logging company was using their discretion and relying on their professionals, and a contravention occurs, they may be excused from this contravention by stating that they used their due diligence to try and limit the problem. 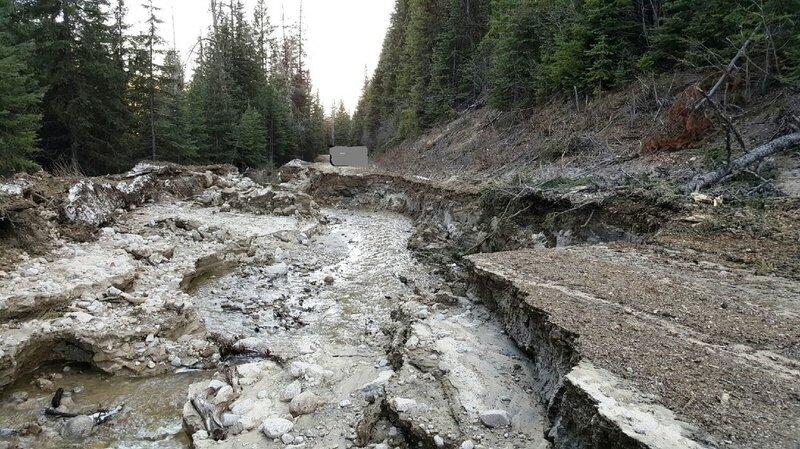 Human error: (2016) a logging road in the Boundary area: The road here was completely washed away: the culprit of this disaster was a pinched culvert . When the logs were being stacked for pick-up, they were placed (or shifted?) onto the mouth of the culvert that allows for proper run-off. When the run off began, there was no place for the water to be diverted, so it ran down the road...until it took the road with it! 'Due diligence' is a defence that is both simple and complicated. It means that if someone is found to be at fault for something and all reasonable steps and practices were taken to avoid it but it still happened, they can say in their own defence that they practiced 'due diligence' and can be found legally not at fault for what happened. In 2003 , during the implementation of the British Columbia provincial government’s Forestry Revitalization Plan, this was one of the legislative changes introduced for the defence of those accused of contravening the Forest Practices Code of British Columbia Act and its replacement, the Forest and Range Practices Act (FRPA). Below are some examples of the use of the due diligence defence. In 2000 to 2003, six landslides occurred in Schroeder Creek (Kaslo) where Kalesnikoff was logging. The Valhalla Wilderness Society brought a complaint against them. 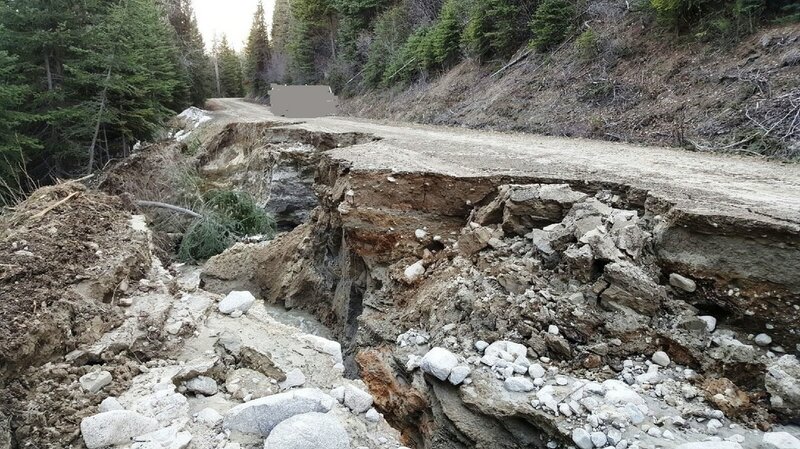 Two of the landslides/road failures were investigated by the Forest Practices Board, and the other four landslides by a Commission (Deputy District Manager) to see if Kalesnikoff had contravened any regulations and what damages to apply, if any. Between the 2 regulatory bodies, they were found at fault for part of it, and fined less than $10,000. Kalesnikoff appealed those decisions partly on the grounds that: "should the Commission decide that it (Kalesnikoff) contravened any or all of the alleged sections of the legislation, it (the Commission) should also find that Kalesnikoff was duly diligent...and that its diligence is a full defense against its (Kalesnikoff's) contraventions." The resulting conclusion of the 72 page Commission's Report was that there were "no contraventions" by Kalesnikoff. There were "no penalties, and previous penalties were rescinded." 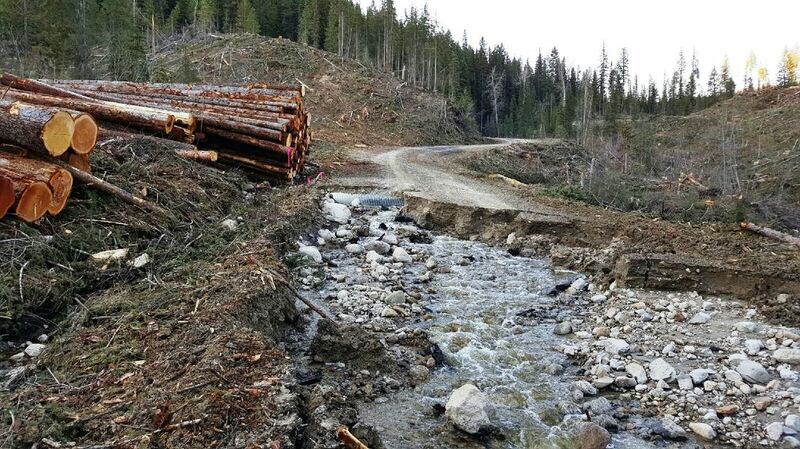 In 2010 ATCO Wood Products was fined for 2 contraventions of Forest Planning and Practices Regulation in regards to improperly maintaining a Forest Service Road and allowing sediment to enter a fish bearing stream. ATCO was fined four thousand dollars. ATCO appealed the decision (2012) on a number of grounds, including that they had practiced due diligence in their road maintenance. In the end, the panel found that "although ATCO contravened section 79(6)(b) of the Regulation, it has established a defence of due diligence to the contravention." For these reasons, the fine of $2000 was rescinded. For the other contravention, the panel found that "there was no evidence of any short term, or long term, harm to fish or their habitat." There was no contravention found and the other fine of $2000 was rescinded. It seems strange that logging companies should hire professionals, lawyers, pay money, expend time and energy to fight claims over a relatively small fine. This zealous defensiveness on the part of the industry, the acquiescence of the Ministry of Forests to their position, and the loophole of 'due diligence' does nothing to inspire confidence that there will be remuneration for any damage. And this behavior is not particular to local companies, but it is seemingly the standard across the industry. If the framework of legislation for this industry illustrated to the public that companies would actually be held accountable for their actions, and if the companies acted as if they would be held accountable for their actions, and if there was stakeholder input into assessing damage, and if those damages could be secured relatively easily (not through long term court action) - it is very likely that the public would have much more respect for the process, and feel more secure in the knowledge of repair and remuneration if damage occurs. 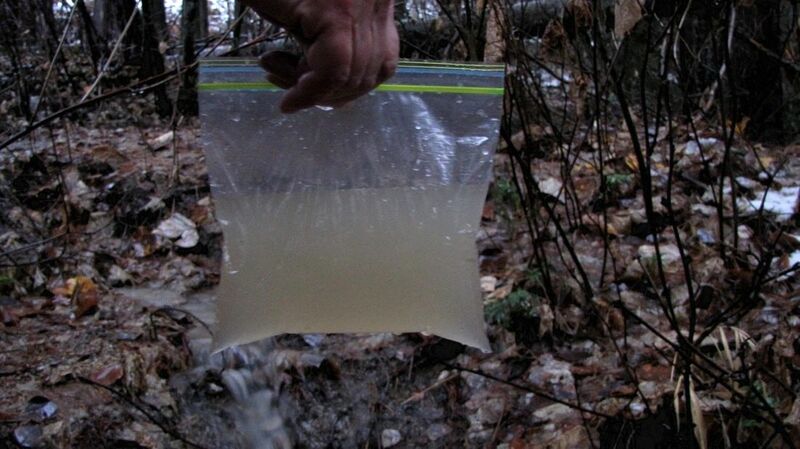 The logging company (BC Timber Supply) supplied water for several months and helped residents fix the water problem, even though "there was no legislated requirement for it (the logging company) to do so." (Forest Practices Board report). In other words, BCTS would have been well within their rights to walk away and the residents would have had no legal recourse, except to sue for damages. When asked if the water system had been 'put back to the way it was before the slide', a resident of Laird Creek said there was 'no way that it could be put back'. In 2016, another resident stated that they have to be very careful in the maintenance of their water source, it can easily be impacted now by natural occurrences like heavy rainfalls. In the 'Summary of Public Concerns' (April 2017) Kalesnikoff Lumber Company responded to the community's concerns about the issue of responsibility. On page 41 of the Emergency Preparedness Manual, there is an expansion on the simple statement above in regards to the determination of responsibility. It deals with this responsibility in terms of who has been found to have caused the damage. Even if a company has 'been found' to have caused the damage, it is not a guarantee that remuneration will follow. For example, it might be determined that the company practiced their due diligence and so are excused from responsibility, or they might appeal a finding and it could easily be rescinded, as in the above examples. Or the damage may occur after logging has started and stopped and then it can be argued that the logging impacts had nothing to do with the damage.